During the duration of my time spent at the Carrizo National Monument, I kept thinking to myself, "How in the heck did I not know about this?" The Carrizo Plains Super Bloom was exactly as it states: super. It left me speechless at times. There were blooms that went so far back into the fields, you couldn't see where they ended. I have never seen anything like this before. I stayed in San Luis Obispo for the weekend to make the drive there more accessible. (It would take you 5 hours to get there from San Francisco) From SLO, it only takes an hour and a half. Well without further adieu, here are the blooms! They slowly introduce you to the plethora of blooms you are about to see. This is the beginning of the 7-mile drive, right where the blooms started to show. The depth of the blooms. We walked towards Soda Lake. These majenta blooms were off the path we took. Here is where you can find the names of most of the blooms. More scenery on the path to Salt Lake. 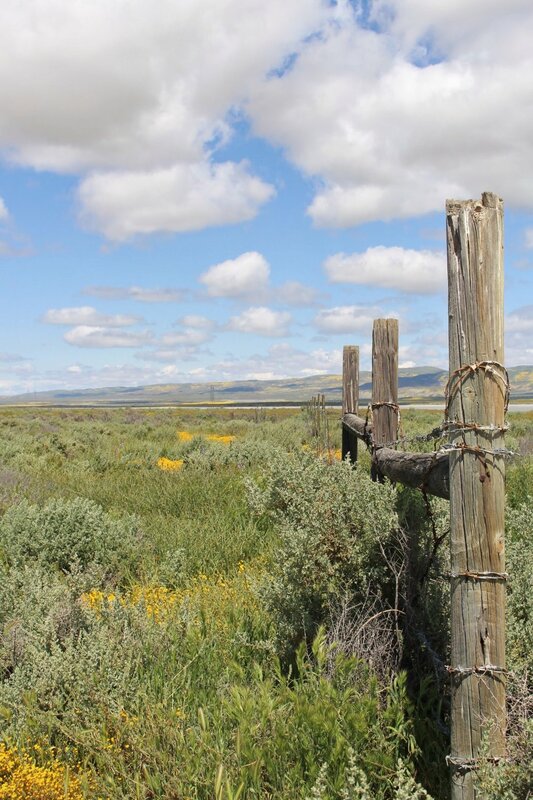 I recommed walking along the Soda Lake boardwalk. An up close view of Soda Lake, that's almost dried out. This is the view walking back from Soda Lake. We drove further down the road, and oh my goodness. There was an overwhelming abundance of blooms. We decided to walk up the Soda Lake Overlook and get one last view of the lake. Teens separating form their embarrassing parents. Some things to note: get gas before turning on highway 58, bring snacks + water, there are not a lot of hikes its more of driving + pulling over, and lastly the end of the 7-mile drive is not a paved road, so bring your SUV if you have one. I stayed at Granada Hotel in SLO. It was right in the heart of downtown and was cute as a button. I unfortunately, didn't have much time to explore SLO that much but did make it to a cute coffee shop called Scout Coffee. I can't tell you how much I enjoyed the blooms. You are sharing this experience with a bunch of other happy people that have radiant smiles on their faces. Go and see this beautiful place soon!